DO NOT REGISTER ON THIS PAGE . WITHOUT CONTACTING. As a participant you will receive guaranteed entry into the race as well as fundraising guidance and incentives prizes such as an athletic race shirt and water bottle. All participants must meet a fundraising minimum of $1,850. 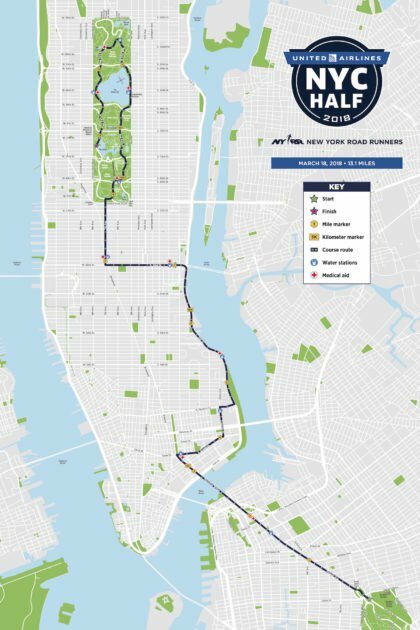 Read about the new course layout for the United Airlines NYC Half, and check back soon for information about wave start times. Miles 1–2: Start on Flatbush Avenue near the Grand Army Plaza entrance to Prospect Park. Bear right around Grand Army Plaza and continue on Flatbush Avenue. Mile 3: Cross the East River from Brooklyn into Manhattan via the Manhattan Bridge. Mile 4: Turn off the Manhattan Bridge onto Canal Street, and follow Canal Street to East Broadway. Mile 5: Take a slight right from East Broadway onto Grand Street, and then a left onto Columbia Street. Take Columbia Street to East Houston Street and take a right, and then follow the exit ramp left onto the FDR Drive. Miles 6–7: Continue north on the FDR Drive. Merge right onto the exit ramp for East 42nd Street. Mile 8: Follow East 42nd Street to Seventh Avenue and turn right. Mile 9: Run north on Seventh Avenue and enter Central Park, following Center Drive toward East Drive. Miles 10–11: Continue on East Drive in Central Park. Turn left at the 102nd Street Cross Drive, and take another left onto West Drive in Central Park. Miles 12–13.1: Follow West Drive south, around the Reservoir, to the finish line at West 75th Street.